As in all 50 states, misdiagnosis and lack of awareness are delaying treatment with costly and devastating consequences. Montanans need better information about Lyme disease and in-state Lyme Literate Physicians and resources. Montanans are contracting Lyme here and elsewhere, and we need care regardless of where we contracted it. This blog offers links to pertinent Lyme resources, including organizations, information, social media resources pertinent for patients anywhere, and news and posts pertinent beyond Montana. The intent is not to re-invent the wheel, but to share good ‘starting points’ (via links and topic lists). For Montanans, we need awareness and change so patients don’t have to travel outside the state for appropriate diagnosis and care. This is the bridge to larger issues, because the political obstacles faced everywhere (treatment guidelines and misinterpretation of surveillance versus diagnostic criteria, as a couple of examples) are further impeded in states not considered Lyme endemic. State and federal agency websites currently display misleading, inaccurate, incomplete, and or outdated information about Lyme Disease, so that additional resources are necessary for a complete (or, sadly, even a basic) picture of this illness. You can find blog posts prior to Fall 2014 at Invisibly Lyme Montana’s former blog on blogspot. This blog is pretty new, and due to the nature of Lyme disease, can only be worked on sporadically. So please bear with me and also check back as this site evolves. To spread awareness about Lyme disease, offer resources and links to patients, and to help fight for better diagnosis and treatment guidelines for Lyme disease and acknowledgement of Lyme disease in Montana. 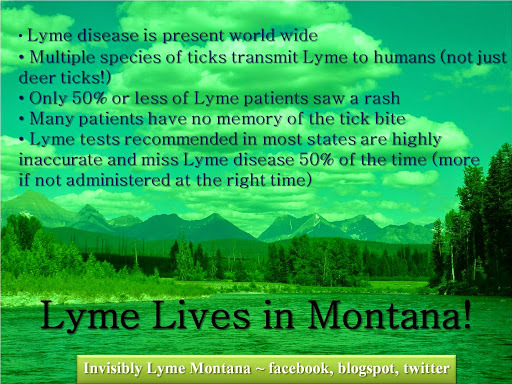 The lack of documented cases contracted in Montana is a direct result of guidelines that wrongly point doctors to surveillance criteria, rather than diagnostic criteria, paired with outdated assumptions about tick distributions and which ticks can spread Lyme Disease. Doctors have wrongly concluded that it cannot be contracted here (precluding it as a potential diagnosis as interpreted by most doctors and keeping it from being diagnosed or reported). They also have politics working against them, in the form of guidelines mentioned earlier, that make adequate diagnosis and care for Lyme Disease unlikely no matter where it was contracted (meaning that if you move here from somewhere else with Lyme, you will still most likely need to travel out of state for adequate care). If Montana doctors were adequately informed about Lyme Disease and allowed to treat with the same discretion as with other similar diseases, I would likely have been properly diagnosed and treated, avoiding the loss of my career and the last five years of my life. Fewer Montanans would end up on disability from a disease that could have been adequately treated with early detection. Additionally, fewer Montanans would get stuck in financial, legal, or procedural loopholes. These include insurance issues, being denied care, and even custody issues. In my case (most recently), although I was bit at work, I am having difficulty receiving Worker’s Comp because they state that I need a letter from the time of the tick bite stating that my Lyme Disease was caused by the tick bite. However, for three years following the tick bite, Montana doctors I turned to insisted that Lyme cannot be contracted here, therefore my Lyme symptoms were due to five or six new illnesses, all coincidental to each other and the tick bite. If I had a letter closer to the time of the bite, I would have had a diagnosis closer to the time of the bite and would not need Worker’s Comp in the first place. So, Montanans with Lyme need to be adequately tested and treated regardless of where they contracted Lyme. Otherwise, all Montana-contracted cases will continue to be dismissed based on erroneous geographic assumptions and no “first documented case” will ever occur that would allow any of us to be adequately evaluated (or documented). http://www.nwlymepatientworkshop.com – Would love to see you at our workshop in October. I was bit by a tick on MT in 2008. Thank you, I will certainly be sharing this! Thank you! We are very excited to have a place for patients to come together.